A little over a month ago, we had the fantastic opportunity to see the Globetrotters live. It was one of the most amazing shows that not only promotes physical fitness and basketball, but humorously shows how teamwork makes the game fun. Now I have learned that that fun and spirited teamwork is being taught with basketball skills all across the country at Globetrotter Clinics. 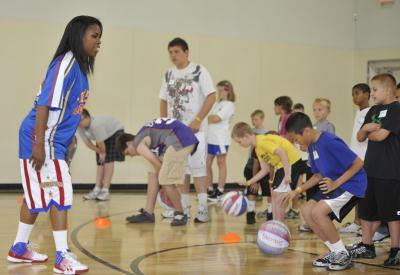 The Harlem Globetrotters have teamed up with 24 Hour Fitness to bring Summer Skills Clinics to numerous locations nationwide. Keep reading for all the information and make sure you register by 5/31 using the code USFAMILY in order to receive $10 off. I thought the clinics would be very expensive--but they are only $59 ($49 with the discount code) and one of the things your child receives is a voucher worth up to $40 to get a free ticket to a game in the 2014 Harlem Globetrotter National Tour.